The healthcare industry is known for being extremely conservative and cautious about any form of marketing, which has made it a real struggle for these organizations to keep up with the trends and the times. This is due to strict HIPAA compliance regulations about the use of patient information and FDA limitations regarding product-marketing practices. But finally, healthcare brands and providers are starting to enjoy the benefits of digital marketing. 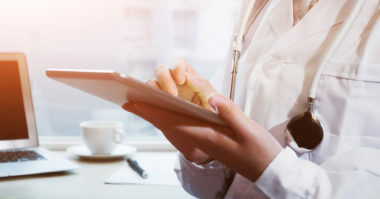 And with its growing popularity and acceptance among patients, healthcare businesses of every size and scope can no longer afford to ignore the outstanding reach and engagement offered by adding digital to their healthcare marketing strategies. As a result, experts believe that digital marketing is poised to completely change the healthcare industry and are encouraging providers such as physicians, pharmaceutical brands, insurance providers, medical device manufacturers, and other healthcare companies to tap into this online practice. Inc.com reported on how healthcare is starting to prosper from the use of digital marketing. 80% of physicians have started using the Internet and search engines for patient diagnosis, treatment, and ongoing care. 84% of patients use both online and offline resources to research hospitals. 44% of patients who research hospitals via mobile actually schedule an appointment. Search engines lead almost three times more visitors than non-search visitors to hospital websites. These are just a few of the reasons why digital marketing has suddenly become critical for all kinds of healthcare providers to survive, as well as thrive. One of the most beneficial ways to reach patients is through consistent content marketing, whether through blogs, videos, social media, e-books, or other forms of online content. According to industry experts, patients find the most value in content that helps them learn more about healthcare services and products. But the only way to be successful with digital healthcare marketing is to constantly create new and compelling content on many online channels. This allows providers to be found on the web and attract new patient leads. By pursuing the practice of digital marketing, healthcare marketing experts can increase their chances of achieving healthy growth. Learn about the latest advances in healthcare marketing. Contact MDG Advertising. MDG Advertising, a full-service advertising agency with offices in Boca Raton and New York, NY, is one of Florida’s top healthcare marketing companies and branding firms, whose healthcare clients include Dental Care Alliance, MDVIP, Max Planck Florida Institute, HCA East Florida, Primary Pharmaceuticals, and MD Now. MDG’s core capabilities include branding, logo design, print advertising, digital marketing, mobile marketing, email marketing, media planning and buying, radio and TV advertising, outdoor, newspaper, video marketing, infographic development, website design and development, content marketing, social media marketing, and SEO. To learn more about the latest trends in healthcare marketing, contact MDG Advertising .